I need to feel the safety of being held by you. Hold me tightly in your arms while this storm roars through my life. I cry out to you, Most High God, and you send your angels to save me. The problems and trials which are overwhelming me are pushed away. I feel your love and I trust your faithfulness. People who do not want the best for me surround me. They desire to take my peace and make me afraid. 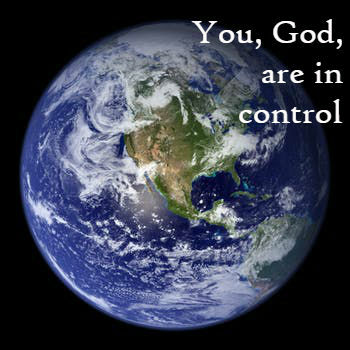 But you, Father God, are in control of everything. With power and love you rule the earth. People around me try to snare me with their lies and tricks. They dig pits with their evil mouths and then fall into the pits themselves. My heart, Oh God, is your’s forever. I will praise you all day long. I will sing about your great love which fills the earth. I will sing about your great faithfulness which reaches endlessly to the skies. You, Father God, are in control of everything. With power and love you rule the earth.